Ten years ago, those who lived through the nightmare of Hurricane Katrina learned how fragile civilization really is. Calm suburbia one day, and gang-controlled no man's land the next. But now some are warning another disaster is inevitable – and Americans are not prepared. Manny Edwards, an emergency preparedness and security consultant and the host of "Survival Tips" on WND TV, says it is "for sure" the country will see something like Katrina again. "And the next time it happens," he warns, "it will make Katrina look like Disney World." Read the brand new book Be Thou Prepared to ensure you know what to do when choas breaks loose. 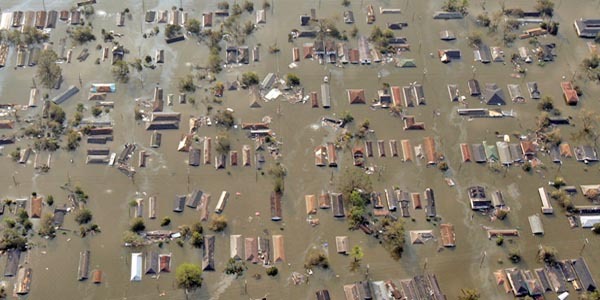 Following Hurricane Katrina 10 years ago, civil order in the city of New Orleans broke down, with widespread looting and property destruction. Heavily armed street gangs actually invaded the city and terrorized residents before order was restored, drawing comparisons to Iraq. One military analyst on Fox even alleged New Orleans police officers were complicit in the looting. WND reported several years back when the National Rifle Association released a series of videos revealing how, following Katrina, authorities simply seized thousands of weapons – legally obtained and owned – after New Orleans Police Superintendent P. Edwin Compass III announced, "Only law enforcement are allowed to have weapons." At that time, just to make sure the message was loud and clear, the city's Deputy Police Chief Warren Riley told ABC News: "No one will be able to be armed. We are going to take all the weapons." Edwards says big government and welfare dependence have undermined America's social capital, creating a society uniquely vulnerable to disruptions and natural disasters. "The reality is that our society is fundamentally uncivilized, and events like Katrina bring it to our immediate attention," he told WND. "Government welfare programs, Social Security, and 'emergency management' agencies like FEMA actually have a destructive effect on civilization. If you can just get a check from the government, why would you need to invest in your relationship with your neighbor? If you believe (mistakenly) that FEMA will relieve you after a hurricane, why waste time building up interdependence with your neighbor?" Local, state, and federal government agencies were widely criticized for incompetence and their inability to protect residents in the wake of the disaster. One of the most indelible images of the Katrina response were authorities going door to door and confiscating firearms. Such incidents, says Edwards, shows how the overweening nature of contemporary government has actually made it far more difficult for citizens to take on the responsibility of citizenship and self-government. "There's much you can do to help yourself and your neighbor in a crisis, but there's very little, maybe nothing, you can do to repair the damage done by decades of depraved government," he said. "The people have been fettered. They are not allowed to judge, because the state has a monopoly of judicial administration. They have little incentive to build up their community, because their rights and goods are dispensed from far away in Washington. Even if they want to get away from corrupt government, they aren't allowed to; the state exploits them like cattle and will not let them out of the fences." Carl Gallups, a pastor, talk show host and former law enforcement officer, has lived and ministered through several hurricanes as a resident of the Northwest Florida Gulf Coast. He has recently written "Be Thou Prepared," a guide of both spiritual and practical readiness for Christians who want to be prepared for disaster, persecution or whatever else is to come. He says the book was partially based on his direct experience. "The area I live in took a direct hit from Hurricane Ivan in September 2004," Gallups recalled. "The next day the region looked like a war zone, with roadways impassible, parts of the bridge destroyed, homes demolished, and grocery stores, gas stations and government offices closed. There was no power, very little communication and few emergency services available. Many people were simply left all alone. Life went from the relative ease of normal everyday American existence to a basic survival mode in one day. That's how quickly disaster can strike." Gallups also experienced Katrina, "even as we were still cleaning up from Ivan." In both cases, the church where Gallups has served as pastor for almost 29 years was used as an emergency shelter, a community communication point, and a staging area for doling out food, water and basic survival supplies. Gallups credits his church's careful preparations for his congregation's ability to help those "in desperate need." "We initiated and assisted in the complete rebuilding of three African-American churches in the tiny town of Pearlington, Mississippi, about a two-hour drive from our church. Then we moved on to Chalmette, Louisiana – just outside of New Orleans – to help rebuild a church and community there. All of this was done while we were still cleaning up and restoring our own community and storm-shattered lives." Gallups found a spiritual lesson in the midst of catastrophe. "All of this serves to remind us just how delicate life really is, no matter the comfort level at which we might currently be living," he advised. "Christians have a biblical imperative to be prepared against 'the day of evil,' no matter how it might arrive. Certainly faith in God on a day-by-day basis is our first calling. But that faith in God also means we obey his word to always be prepared. "The main reason we are to be prepared is so that we can minister the love of Jesus to the world around us – even in desperate times. And the pages of the New Testament, beginning in Acts, demonstrate that this was the lesson that even the earliest church had to learn." On that note, Edwards offers some practical guidance for those who want to be prepared for the next natural disaster. Get a copy of Survival Tips here. "The first priority is to have a safe retreat, or bugout location," he instructed. "This could be the family farm in another state, a cousin's house, or a hunting cabin in the mountains. Just make sure it's far enough away to avoid the damage you expect from a direct hit. You should have a primary route and at least one alternate route that avoids major highways. Ideally, you would be able to reach your destination on one full tank of gas. "Then, identify your 'triggers' for departure. If you're in a high population density area, you have to be out early, before the roads get jammed. That means you have to have your vehicle stocked at all times, or at least have everything in a closet by the door ready to load, so you can leave within one hour of your decision to go. Keep an eye on the weather forecasts, and get out early. "Once your escape plan is in place, the second priority is to shore up your preparedness in your area. A hurricane that strikes some distance away and does little damage in your area can still wreak havoc on supply lines and electrical power delivery. I recommend two weeks of food and water for everyone in the house, plus half. So for a family of four, plan for six. It is very important to coordinate with your neighbors – they are potentially your greatest resource in emergencies. You can offer mutual protection from starvation, the elements, and roving gangs, sealing off your neighborhood if necessary, but it requires cooperation… the kind of thing civilized society is built on." Unfortunately, Edwards believes far fewer people are capable of that kind of cooperation today than there were in the past. And he suggests the inability of people to care for themselves is ultimately the result of a lack of faith. "The power to govern should reside within society, but it doesn't," he said. "It is held by people who are exempt from the rules by which they govern, and they never suffer the consequences of their bad decisions, so there's no incentive for them to avoid making them. "However, in a sense, it is not just a failure of government, but a failure of the people, who for no good reason that I can fathom have trusted this elite group of people with the power to exploit them and control their destiny. I firmly believe that the very existence of the state is the result of a lack of the people to trust in God." Learn survival tips and tricks from the expert. "The principles of preparation are quite broadly applicable, but the details of preparation are unique for every family," he said. "I highly recommend that everyone consult an emergency preparedness expert, and encourage their friends and neighbors to do the same – for everyone's benefit." Gallups also pleads with people not to ignore the issue of preparedness. Having seen the consequences of neglect, Gallups says he could not keep his hard-won lessons to himself. Said the pastor: "This is why I wrote the book 'Be Thou Prepared.' It comes with my 40 years of combined law enforcement and ministerial life. I have ministered in, and worked through, the tough and disastrous emergency times of people's lives for decades. I have learned a lot during those years and wanted to share the benefit of the biblical and practical wisdom and knowledge that the Lord has given to me. "The book, I hope, is a treasure trove of biblical perspective, mental and emotional preparation, as well as offering tons of logistical information on how an individual Christian or church family can prepare for the potentially tough times ahead without feeling like they have stepped over the lines of common sense and a biblical faith-walk with the Lord." Get your copy of Be Thou Prepared here. Watch the trailer for Survival Tips here.